Creating sales territories has never been more important for door to door and field sales teams than it is today. Unfortunately, sales territory design is a process rushed through by the majority of managers. This is a major issue for something that is guaranteed to have a considerable impact on each salesperson’s ability to achieve their quota. HBR found that optimizing sales territory design can increase revenue by 2 to 7% without making a single change to the company’s overall resources or strategy. When done properly, there’s a good amount of leg-work that goes into sales territory design, but it’s a crucial part of setting your team up for success. Sales territory design is often viewed as a tedious process by managers who lack a thorough understanding of the direct impact it can have on their team. Quite simply, this is one of the first steps you should be taking to ensure your team is working an area with enough quality prospects that match your ideal customer profile. With the amount of analytics available today, salespeople should rarely be walking into new territories blindly. Lead generators, like Lead Machine, are a great way to identify key territories and potential customers based on the market demographics of your ideal customer. Establishing a well thought out sales territory design will take a lot of effort in the beginning, but it’s imperative to invest the time, energy and resources. Not doing so will waste your sales people time and cost you money. Don’t risk losing out on closeable prospects because you didn’t take the time to plan. – Research by the academics Andris A. Zoltners, PK Sinha and Sally E. Lorimer showed that sales territory redesign can increase sales by as much as 7% —without altering strategy or budget. Understanding that your sales fortune is in the follow up shouldn’t be news to you at this point. Have you ever looked into the accounts each sales rep is actively following up with compared to the ones they’re not? There’s a lot more to the story in addition to making sure salespeople are re-engaging potential customers. Many organizations have reps who aren’t following up with quality leads, and others who are spending a good portion of their time chasing low-potential opportunities. It goes without saying that this requires better data… and coaching. On the other hand, many fail to consider the very real possibility that this is a sales territory design issue. The salespeople who don’t have the number of high quality prospects needed to stay busy on a daily basis are almost forced to over pursue the potential customers with a low probability of converting. That’s clearly not an ideal situation. And what’s even worse, is this can cause good accounts to be ignored. When sales territory design isn’t a priority, some salespeople are blessed with an abundance of quality leads to work while others are stuck chasing the chicken. The sales rep with too many accounts to work often becomes too busy to put forth the required effort needed on every deal. These individuals also tend to make their quota solely by working the “easy” accounts due to the large number of leads in their funnel. They lose their drive and hunger. The easiest and best solution for resolving this issue is to reexamine how you design sales territories. If you end up in the situation above, you could be forced to redistribute accounts from one sales rep to another, leading to a lot of complaining. This type of negativity casts a black cloud over the company culture you’ve worked so hard to build. Turnover is a very real problem in today’s sales culture. Estimates of annual turnover among U.S. salespeople run as high as 27%—twice the rate in the overall labor force. A way to solve this issue – one that you may never have considered – is in how you design sales territories. One symptom of poor sales territory design is picking up on the trend you’ve failed to notice for so long: a revolving door in certain territories. A very common reason salespeople leave is because they aren’t making money. Assigning new hires to territories that aren’t showing much promise is almost setting them up for failure. While most won’t want to admit this, the correlation between sales and factors related to the salesperson’s effort and ability are likely less understood. Reps who don’t have the level of opportunity and success early on will easily get discouraged. You’ll quickly notice any positive momentum they had start slipping away, and with it goes their time of employment. This is especially the case if they see other people in the company experiencing a high level of success. Watching tenured salespeople who can milk a territory yet still find a way to be 100% over quota will only lead to frustration. The easiest way to combat this issue head on is to assign accounts to salespeople who have low opportunity. Implement a cap or required activity level on opportunities and reassign the ones that aren’t met. This is assuming the sales rep not getting the same number of quality leads is actually putting in the effort needed to achieve their targets. By giving more accounts to salespeople who have low opportunity, those salespeople have a greater chance of generating sales and becoming successful. This could address a retention problem. Every team will have top performers and under achievers, but where are the rest of the team members falling on the achievement scale? You want your top performers to make the most money, of course. But consider the message it could be sending to others on your team. The longer a sales reps tenure, means they get the highest incentive pay despite the harder working and more skilled salespeople simply because the deck is somewhat stacked. This issue is similar to what occurs when there’s a high rate of turnover. If the highest earning sales people aren’t also some of the hardest working, it could be a result of unfair sales territory design. Your compensation structure may need to be restructured to match your sales process. Opportunities that are unevenly distributed skew the common metrics used to determine incentive-based pay. When the numbers are impacted so heavily, it’s likely due to the territory more so than it is the sales rep. The reason being is that metrics tend to favor those with a greater number of large accounts in their pipeline. An alternative comp plan is based on a market share metric where those with fewer opportunities and accounts are more heavily favored. If you want to accurately represent performance and ability within your organization, consider rethinking your sales territory design strategy to give reps more equitable opportunities. Doing so will significantly increase the likelihood that metrics will paint a clearer picture based on sales skills, leading to properly incentivized pay. The goal should be to build a culture that enforces pay for performance. Establishing a fair compensation plan is one of the most effective ways to motivate salespeople. It’s essential to evaluate whether or not your sales territory design strategy is aligned with your current business model. Skipping this process will continue to lead to misalignments that prevent your team from achieving their peak level of productivity and efficiency. Sales reps only spend 22% of their time actively selling due to a variety of reasons, one of the most common being inefficient processes. Establishing an effective sales territory design strategy is a simple solution that will help your team double their selling time. The dynamic landscape we’re in today means that any number of factors can wreak havoc quickly, sending things into disarray. As a best practice to remain current with market demands. At a minimum, it’s recommended to re-evaluate every two years. Due to the data-rich environment we’re in, you have access to more information than you could ever need to address any problems you may be facing. The best and easiest way for the majority of companies to start the sales territory design process is by focusing salespeople through a combination of geography, industry and size. For companies whose sales are highly relationship-based, randomly placed or sized, or target a very limited number of prospects, “named” accounts are a common alternative approach. Key considerations in territory design…. Does the territory design allow easy travel time management? 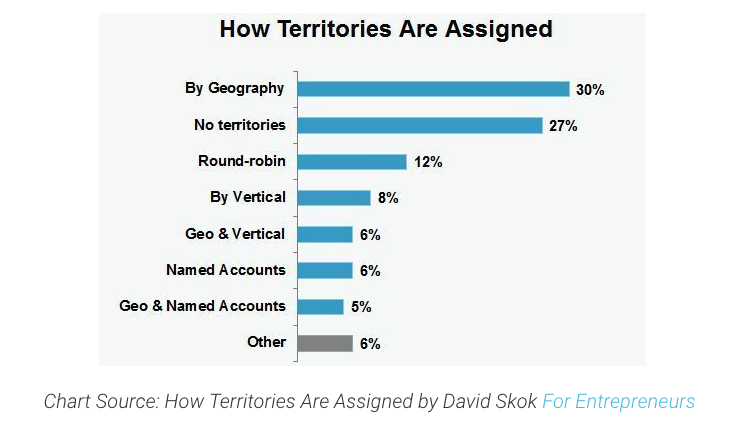 Sales territory design starts by breaking down your revenue split, where your current customers are, and the revenue generated from inbound vs outbound leads. Current Customers: Where are your best customers and prospects located? Geographic and industry-based clusters are the most common focus because it’s easier to get new customers in an area with existing customers. Historical sales data will become your new best friend as it’s the best predictor of future success. A sales tracking software will give you a complete history of this data by placing a pin on the map for each customer’s location to get a visual, or you can generate a list and filter based on the criteria you set. Inbound Leads: When inbound leads convert, focus on the demographics such as geography, industry and size. Then, build a strategy to divide them as evenly as possible across your sales force. The focus needs to be on revenue generated from inbound leads as opposed to volume of leads. Outbound Prospecting: Sales territory design for outbound efforts begins by first laying out the territories to work, then overlaying them with prospecting territories according to how you’re allocating salespeople. For example, you assign two sales reps to each state (two territories) and one canvasser (one prospecting territory). It’s important to know how each sales rep stacks up against the team. To accomplish this, create a scorecard and evaluate your sales reps to identify who your top, middle, and low level performers are. 1. How much is their quota? 2. Do they consistently achieve this number? 3. How many current customers and prospects are in their funnel? 4. How many viable prospects are located within their territory? Once ranked, match the most fruitful territories to the higher ranked reps. However, things change throughout the year. Sales reps can exceed or fall short of expectations. So if adjustments need to be made, go ahead and do so. Accountability produces results. Think about what you want to accomplish and create S.M.A.R.T goals. Most Profitable (Least Risky): Evaluate which of your territories are most successful and double down on what’s already working. Most Growth: If you’re more focused on the long-term instead of the short-term, focus on territories that haven’t been worked yet. It’s likely to take longer to become profitable, but will generate greater growth over time. Learning / New Markets: To establish yourself in a new market segment or determine if it’s viable, send a canvasser into this territory to accomplish a specific task. This will help determine exactly what’s needed to succeed in that market. territories and allocate in a way that gives everyone the their best chance for success. The importance of this data isn’t limited to just understanding the needs of individual sales reps. Sales metrics are invaluable in understanding the success of every sales team within the company, and entire sales department as a whole. They help you to spot trends and determine efficiencies, and inefficiencies, within the company. 3. Graphs representing team performance, best time and day to knock, etc. Involving your sales reps is an important step in this process. Your team may surprise you with ideas you likely wouldn’t come up with on your own. It may take a little longer to develop the plan, but they’ll have a greater sense of importance by being included, which will eliminate most of the typical frustrations associated with change. If the sales territory design is on-point, the workload of sales employees declines and they become more efficient and thus, more successful. And a successful employee is a happy employee.